Men's Cycling Clothing - Ride Your Bike in Comfort! Feel more joy when you ride your bicycle. As cyclists, we need comfort in all kinds of weather. Depending on the weather and season, you will need a variety of cycle clothing to keep you comfortable throughout the year. Aero Tech Design's cycling clothes come packed with features to help you find comfort with clothing that feels like a second skin. Each of our men's cycle garments is designed for the rigors of the cycling motion. Men's Cycling Clothing is developed specifically to help our fellow cyclists ride longer and feel stronger. The fabrics are high end materials that enhance athletic performance. The fabrics have excellent perspiration dissipation and move freely through the cycling motion. The bike shorts are engineered to absorb shock, prevent chaffing and endure the dirt and elements of long road rides. Our men's cycling clothes are made for all types of riders with the best quality materials. We use the Martindale abrasion test on every fabric we use to make sure it is rugged enough to endure the rubbing that comes with cycling motions. Our materials are proven to provide added value to our product designs. Our high performance men's cycle clothes are easy to wash and wear. See our Testimonials and Product Reviews for an overview on our men's cycling clothing. WHY BUY AERO TECH DESIGNS - MEN'S CYCLING CLOTHING? At Aero Tech Designs, our men's cycling clothes are developed specifically to help our male cyclists ride longer and feel stronger. Our fabrics are high-end materials that enhance athletic performance, have excellent wicking ability, and move freely through the cycling motion. As designers and fellow riders, we test and work until the garments deliver a passing consensus within our design team. We like our clothing to be like second-skin, meaning that once you put it on, it feels natural, so you can focus on the ride ahead. There is one big reason our customers keep coming back for more...Comfort! Some shorts have a fourth benefit, compression from spandex fabrics. Compression bike shorts are proven to reduce fatigue and enhance blood flow to the muscles. 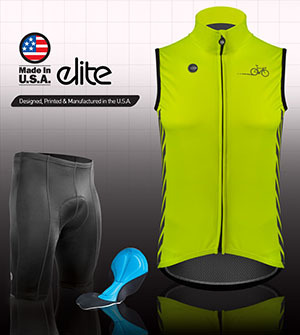 Our men's cycle shorts and bibs are available in a variety of internal chamois padding. We have thick, gel pads for Century riders and thin, lightweight pads for Racers to choose from. So, depending on your preferences, we have lots of chamois pads to choose from to keep you riding longer and feel stronger on the road ahead! Don't forget to use chamois cream! Our men's cycling jackets are designed to keep you dry and warm while you ride. We use quality, high-performance fabrics to create our weatherproof jackets and 3M Scotchlite reflective materials for enhanced visibility in low light conditions. We recommend purchasing at least one lightweight jacket that is packable cycling jackets. into the size of a sandwich bag to travel with, in case of sudden weather changes. At Aero Tech Designs, we present a variety of athletic and high-performance socks. We design and produce luxury cycling socks made of high-end fibers. A big part of comfortable men's cycling clothing is keeping your feet dry and comfortable. We also sell running socks with padded soles. All of our socks are made with advanced moisture management fibers like Coolmax and Dri-Release. These materials dry quickly and have an everlasting wicking property with odor control. No more sticky, smelly feet! Sweat can sap your strength, so managing the evaporation of this moisture means you spend less energy to cool your body, enhancing your athletic performance and endurance. Ride Longer and Feel Stronger! Bicycle commuting offers many physical health benefits as a form of exercise. Don't want to wear your spandex to work? Have no fear, Clark Kent! We've got you covered. Our men's bicycle commuter clothing has an urban look with it's loose fitting, casual look, technically designed for riding your bike in the city with style and comfort in mind. Our Urban Commuter apparel line is made with stretchy fabrics, reflective trims for visibility, and quick-dry materials for all-season comfort and arriving at the office with no sweat. Do you bike in the cold weather? Don't forget to keep your fingers and toes toasty warm during winter time biking. Now, you too can cycle in comfort with our windbreakers and cycling jackets. We have biking tights that are windproof, shoe covers and gloves. All these items are designed specifically for cycling comfortably. A key part of men's cycling clothing is the range of items needed to find comfort in all weather conditions. We see cycling clothing as part of your gear that helps keep you confortable in the great outdoors. Highly technical materials are included in the garments that feature wind resistance, reflectivity, high visibility colors and stretch fit. Keeping dry, and warm in the cold is a key feature in our cycle jackets. We also have arm warmers and leg warmers that are great in the spring or fall because of the rapid temperature changes that are possible on a bike ride. These removable sleeves are easy on and off to adjust to the weather.In all seasons, a great high performance sock like our coolmax cycling socks keep your feet dry through all kinds of weather. Good Read:How To Dress for Cold Weather Cycling. Lastly, don't forget and a specially designed bicycle jerseys with back pockets that are easy to reach with one hand while you are riding. We have the latest on-trend style ways and sell great fitting cyclewear brands. We sell regular men's jerseys in a fit that is athletic and trim, also loose fitting garments that actually fit the real average American man. We also sell men's tops in tall bike jersey sizes and Big men's biking jerseys.. Need a team jersey for your club or fundraiser? See our Custom Printed Cycling Jerseys for your next event. Read our article all about cycling jerseys. Aero Tech Designs is all about making cycling apparel that helps riders "ride longer and feel stronger". We travel across the country to promote our cycling clothes and gear, meeting and greeting our customers along the road. Come visit us at one of the many cycling events we attend each year and don't be surprised to see us on our bikes. We are cyclists ourselves! We have the latest technology to support our customers with fast production, fast shipping and excellent customer service to follow up any type of support needed to get the most out of our products. We take pride in our commitment to produce quality cycling apparel made here in America. Unlike our competitors who manufacture all their products overseas, our cycling apparel is designed, printed, and created by American hands in one of our five United States-based factories. We support American jobs by hiring local staff and we purchase American-made materials, from the fabrics to the thread, from the highest quality vendors. We make great cycling apparel, just ask our fans! We have an amazing and loyal customer base! If you need more details on how to buy cycle clothing, see this article on why you need it. Cycling Apparel - Why you need it.